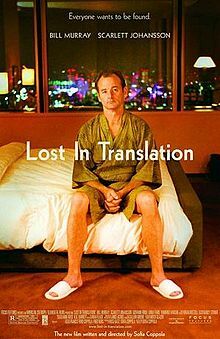 I first saw this film in 2003, but watching it again reveals the tight and brilliant composition by the director, Sofia Coppola. It’s a shame that it was robbed of it’s rightful “best picture” status by premiering in the same year as the bloated, bombastic third entry in the Lord of the Rings trilogy, which has nothing to do at all with good film making; while LoTR III is just another cog in the wheel that Jackson established years earlier, this film is an original piece of art that stands alone (without the scaffolding character and story development of preceding entries). Murray and Johansson both play isolated and lost figures, but no one seems to key in on the somewhat masculine fantasy of the film. Murray’s character is long past the age where he is a bona fide player (or even talented actor), but his charisma and limited stardom (sparingly doled out with painful humility) make him the ideal object of the abandoned Johansson’s affections. Murray’s character is often mistaken for “gentlemanly” when he is actually quite paternalistic early on (notice the way in which he carefully puts Johansson’s character to bed). Only after his *spoiler* tryst with the lounge singer and his reconciliation with Johansson does he come across as (not necessarily a romantic interest, but) the identifiable soul mate (though I hate that term) for Johansson’s character. It’s a well-considered pivot, showing both the ease with which he could have many women in a superficial sense transition back to his desire to form a deeper connection with someone who both understands his ennui and equals (or surpasses) his own penchant for sarcastic banter. While they meet at widely different ages, their backgrounds allow them to appreciate the same verbal interplay; it’s a relationship that’s doomed to last but a brief moment in their life arcs, and that’s what makes the final parting so heart wrenching. If you watch it only for the scene where Murray and Johansson first go out on the town and get chased out of a bar by a pellet-gun wielding bartender, then sing karaoke and return back to their hotel enclave, you will have seen enough to enjoy the film.